The air blower fan is metal with a power of 1/2 HP. The max RPM of the unit is 3300 and it has a size of 38 x 31 x 36 cm. The air blower fan has an electric motor that allows the unit to pull air into the unit through the grill, which it then propels out with force. The fan can be used in conjunction with ducts to move air over a longer distance with more precision as well. It has one speed setting along with a handle that enables it to be moved easily. The air blower fan is used for home, commercial, or industrial applications in ventilating enclosed spaces such as attics, for drying floors and removing moisture after a leak or a flood, and in general in any environment where ventilation or drying is necessary. 18 AWG Cord x 8 Ft.
Best answer Hello Scott, thank you for your question. In theory I suppose you can as the fan is powerful enough to extract large volumes of air per minute. 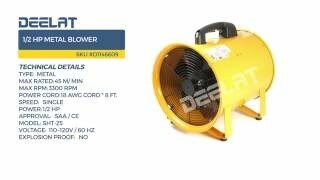 That being said, this blower is not really intended to be used to collect dust and we would need more information on your application ie drawings, designs, etc to make a final decision on whether it would or would not work for your needs. Best answer Reaches full speed in less than 3 seconds. No idea about smaller ducting. Seems pretty powerful. Quite LOUD. Best answer Hello Scott, thank you for your question. The air blower fan moves an air volume of about 25m3/min which translates to roughly 885 CFM, We do have other models that are a bit bigger which have more CFM or smaller that has less CFM. Best answer Hello Eugene, thank you for your question. This portable exhaust fan will certainly work to remove harmful fumes from a booth, however, only if the varnish fumes are not flammable. If the fumes you are trying to extract are flammable you will need to use an explosion proof ventilator or air blower. As long as the fumes in the booth are not flammable you should be OK to use this exhaust fan. Best answer Hello Don, thank you for your question. Yes you can certainly use our portable exhaust fan to exhaust a server room or any room for that matter. However, the maximum consecutive run time to safely use this ventilator is 1500 consecutive hours. We would not recommend running it any longer consecutively.